Suggest a caption for this very funny fishing photo for your chance to win a pair of Fish Polarised Sunglasses valued at $79.95! Simply post your funny caption in the comments section of this article or on the FishMax facebook page, to go in the running to win a pair of Dorado Sunglasses by Fish worth $79.95. Entries close on March 14, 2011. Winner will be contacted by us in late March 2011 and will be announced here on FishMax.com.au. The winner will receive a FishMax sun-safe pack comprising a pair of Dorado Sunglasses by Fish with a RRP: $79.95..
"maybe I should switch to live baits?" They say Bass like muddy water, but is this what they mean? These new green zones really don't leave many quality fishing spots! I wish that #@%$%#%g bloke spearfishin' would stop tuggin' my line!! I reckon I am going to get a big one today! What a stupid place to be driving a Van. He's gonna scare the fish. 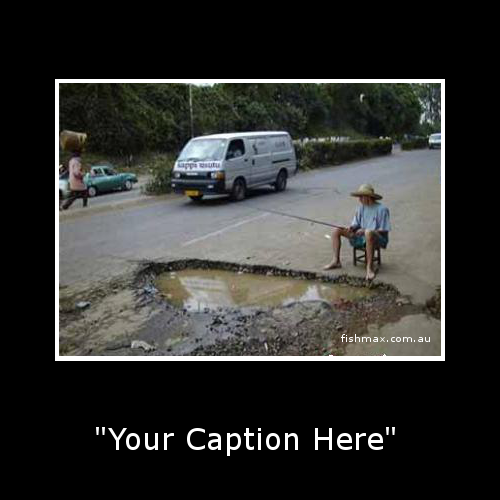 It's a great fun to join the unique online contests, Funny Fishing Photo caption contests and to win prizes. Great opportunity to win attractive gift a pair of Fish Polarised Sunglasses valued at $79.95! Good part is to post number of captions so more chance to win prize. Ya not a hardened fisherman if you haven't fished in rock solid bitumen! If I get snagged on another bus, pity help me! Think his GPS mark was a bit off! Australia's equivalent to ice fishing! What are you laughing at...This is the only place left to fish in SA! "It's time to get back to basics!" Found fish? Now for some 'tar' chips! You've heard about the one that got away.....well it got away in this puddle! Dad told me "Little Fish are the sweetest"
"Yeah! I know I'm a stick in the mud, but I've already had about a hundred bites! Fair dinkum!" Knowing my luck I’ll probably pull up a fish this time, when all I want is to get my boots back! Who would put a barrel on their head? Some people have no self respect!